They tell me that right up to the end, Santa couldn’t understand why the elves, whom he had always sternly but in his mind fairly treated, had turned on him so. Hadn’t the hovels of mud and seal sinew that he gave them kept them out of the snow, even if the hovels were not heated, and faced into the wind? If the gruel he fed them once daily was watery and thin, was it not still sustenance? Did he not instruct his overseers and factory goons to whip the workers only when they had fallen behind in production, or were insolent, or spoke during work hours? These were not reasons for rebellion! These were examples of his benevolent generosity. As the elves roughly stood him up against the wall of the factory, Santa resolved that once his reindeer shock troops arrived to rescue him, the time of his generosity was over. The problem was not that he had treated the elves too harshly, it was that he had not treated them harshly enough. He had made the mistake in assuming the elves could be treated like people, instead of the small, pointy-eared beasts of labor that they were. It was not a mistake he would make again. After his reindeer henchmen arrived, he would make an example of several of the elves, starting with their spokesperson, the elf girl. Yes, yes, she would be the first to go. He smiled at the thought. Then his smile faltered as this same elf girl stepped in front of the firing squad, accompanied by a familiar, quadruped shape. The reindeer smiled cruelly. “Viva la Elfvolution, Santa,” he said. Santa stared blankly into his traitorous lieutenant’s red, glowing nose as Rudolph and the elf girl stepped back behind the line. Somewhere in the far, deep distance, he heard the sliding clicks of the firing squad readying their weapons. 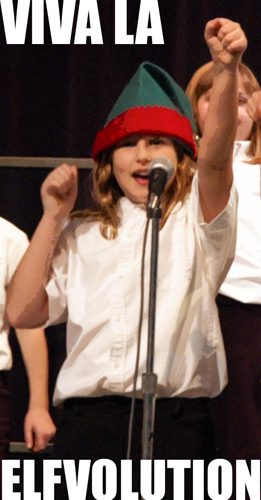 Alternately, it’s a picture of my kid at her school’s Christmas choral concert, wearing a festive hat. What sort of sick, tortured upbringing leads one to immediately imagine the violent death of The Claus when you see your daughter at a music festival? I’m all for Elfvolution! That was a fun story and made me laugh and I did need to laugh so thanks for that. I’ve been to a few concerts like that…. When your own kid isn’t on stage, the mind, it does wander (actually, mine tends to nod off). I wonder how many great novels got their start at some interminable assembly? Is she wearing a kippah under that elf hat? The day she uses you as inspiration for one of her stories will be very interesting. …he heard the sliding clicks of the firing squad readying their weapons. And, too soon, his bladder loosened, ruining his best velvet britches, before the realization came to him that the only weapons this filth had were Nerf pistols and SuperSoakers. Santa never caught on that the real reason productivity was down in The Workshop was the Elves were building the tools of Freedom! Down Claus, up the Elfletariat!! …the only weapons this filth had were Nerf pistols and SuperSoakers. No, they had Red Ryder BB guns, which put Santa’s eyes out. And the elfs banished Santa into the kind of punishment like in Nicholas Was by Neil Gaiman…. No skin off my bones. Santa’s been my mortal enemy since that NORAD incident five years ago. Personally, I hope these elves are more… reasonable than he was. Nobody wants another Christmas War. Sounds like Santa was killed by organized labor. Unions – where will the evil end?? And “All I want for Christmas is a firing squad” has similar scansion to “All I want for Christmas is my two front teeth”, too. Sadly, it all ended a few years later with a disillusioned Rudoplh captured & executed in the Bolivian jungle. 40 years later, North Pole t-shirt manufacturers will make a fotune selling his his image to gullible college students. In re concert comment: Say it ain’t so, Johnny! Up the elves; down the Santanistas! Remember Santa and Satan are almost the same word! I see restructuring in the future, but perhaps he’ll have to ask for a government bailout first. Times are tough. If I ever have a daughter I hope she’s as adorable and smart as yours! wait, if the little person living in your house is an elf…. EVERYBODY, SCALZI IS SANTA CLAUS!!!! I always knew that fat S.O.B. was a plutocratic exploiter of the working class. Clearly, Santa’s shop needs to be turned into communal property, and some sort of five-year plan implemented. Why doew it not surprise me that your daughter is leading the elfolution? This story reminds me of my favorite Christmas song of recent years, which tells the story of Elfs unionizing and striking against Santa. I read “Pharyngula” too much. When I saw the lolcaption, I thought this post was going to be about the changes in the elves’ form over time in response to the differing environmental conditions at the North Pole. Such changes might include Santa’s highly-insulative belly and smaller noses and ears for North Pole elves for less frostbite. In the future, I expect the North Pole elf population to continue these trends; we may also begin to see aquatic adaptations such as webbed toes and as the North Pole icecap becomes a seasonal thing. You are SO on the naughty list now. Patrick, do you want to explain to Krissy that she’s Mrs Claus? Get back to us on how well that works, OK? You’re a weirdo John. But, you’re my kind of weirdo. Ah yes, the perfect answer to my Bah-Humbuggishness. Death to Santa! Viva La Elfvolution! Now that is some funny stuff! I bow to the master. Sorry, the black pants and collared white shirt screamed “school concert” so loud I couldn’t hear the upraised fist over them. For anybody who is interested in something Santa and science fiction related, Phil and Kaja Foglio have published a neat picture online. It’s from a childrens’ book published in 1907, and depicts Santa as he would appear in 2007. 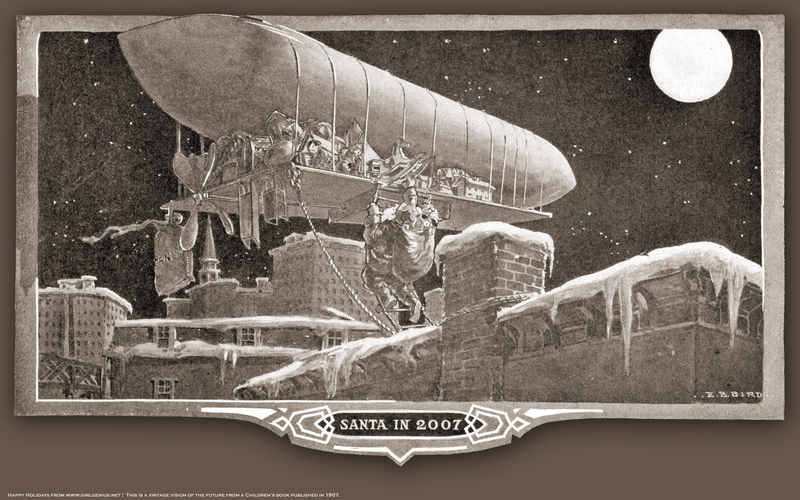 That Santa got rid of his reindeer and uses a blimp to carry his presents around the world. We can hope that the alternate Santa shown was more humane to his elves. He probably had some yummy venison steaks right after the switchover.